Calrad’s new 92-159 designer style IR block provides a simple in-wall solution for IR signal distribution, works with all Calrad and industry standard IR distribution products. We continue to improve on the support of web tablet based devices with every new xLobby release, working on features, reliability and speed of the interface. 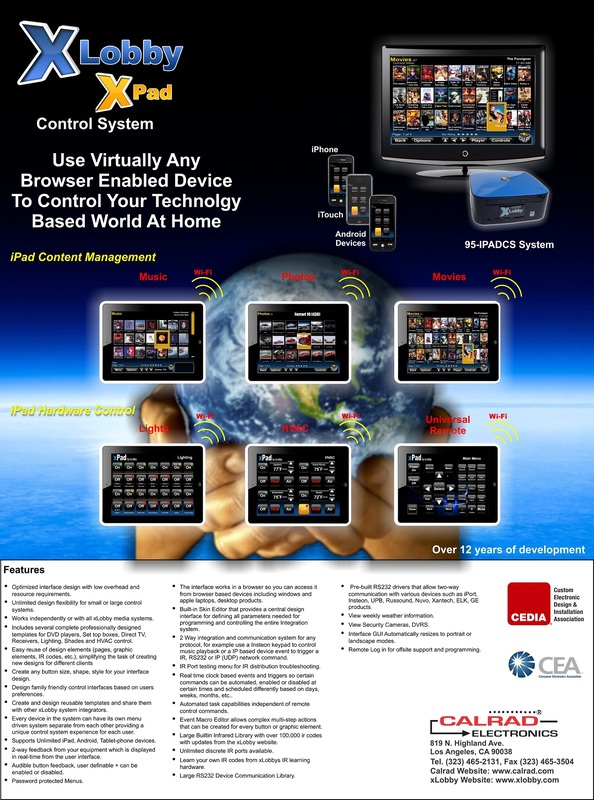 This new platform allows users and installers to build control systems with virtualy any web enabled device that already exists or add specific devices to the installation. Some of the new features that will be available soon are listed below. 1. Users can create control menu’s with many devices in a very simple project step configuration based on individual rooms or whole home control type designs. Creating or loading interfaces will be easy using our new Screen and Template design menu’s in the skin editor. Independently designed control interfaces can easily be setup for iPad screen sizes and devices with smaller sized screens, so each device can have it’s own background and button layouts. The control interface layouts can be created indivdualy and simultaneously from the same menu. 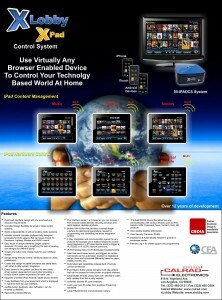 For example: Step one: what devices will be used for control, iPad, iTouch or a Droid phone, etc. . Step two: how many devices are you going to control 1, 2, 3…etc., Step three: Start menu templates with various designs + your company logo are (optional). Step four: From a list of products select the brand and model of the display, then select the brand and model of your stereo receiver, select the brand and model of your set top box or satellite receiver, select the brand and model of your DVD player and xLobby xPad control system will add all the advanced or basic required buttons and IR codes to each menu automatically along with all the needed navigation buttons between menus. Any of these devices can easily be updated and replaced if products in the installation changes. 2. Template style control menu’s with mixed or assignable IR ports. 3. Screen designs can be saved, exported and used for other installations. Through the xLobby update system protocol, templates and designs can be shared with other xLobby users. 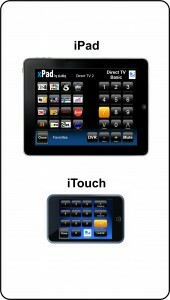 This screenshot shows control menu’s for the iPad and a iTouch, both track the same design (Direct TV basic) but have different menu layouts and buttons properly sized for each device. News and more screenshots of the GUI for the xPad platform will be updated on a regular basis. The 10-DCT-Kit provides signal conversion of Toslink digital signals found on many new display designs and provides a simple method to convert the signal from optical to digital SPDIF that can easily be delivered over Cat 5e, Cta6 UTP cables up to 300 ft.. Includes 1 x 40-DCT2 Converter, 7.5Vdc power supply, 2 x 40-DA02 passive audio-video baluns. No assembly tools required. The 72-265 USB interface cable is compatible with Over 60 different Cell Phones And Electronic Devices. Use the 72-265 interface cable to communicate or charge the battery with PC’s, Laptops, wall chargers. You are currently browsing the xlobby news blog archives for June, 2011.